Happy New Year! To be honest, I'll be glad to see 2014 go. It wasn't a bad year, but it wasn't a great year either. And because I really don't feel like looking back at 2014, I won't be posting a mosaic of all my makes for the year. 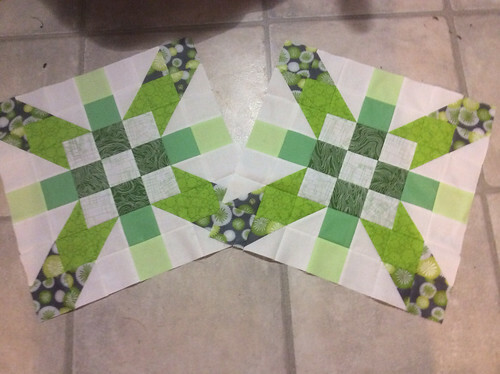 Instead, I decided to write a final WIP Wednesday post even if there doesn't appear to be a linky over at Freshly Pieced today. 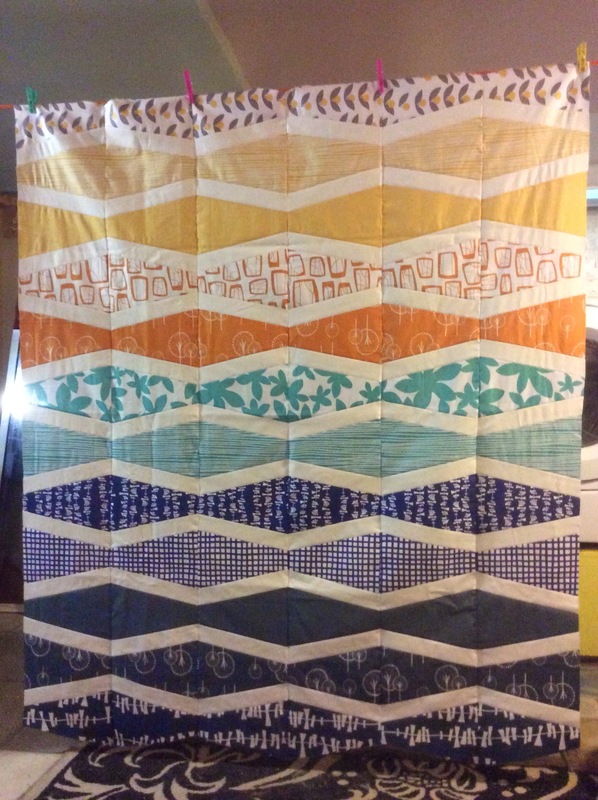 I am closing the year and starting the new one working on my New Wave quilt. We found out right before the Holidays that my brother's mother-in-law has a very aggressive breast cancer and will need to undergo 6 months of chemo therapy. She will lose her hair and pretty much feel like crap. 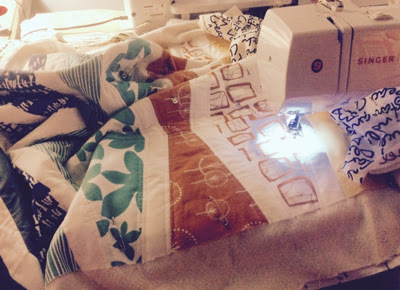 And what do quilters do when someone needs a little support and comfort? We make quilts. So New Wave will be going to Liane and I hope will make the next 6 months somewhat easier. 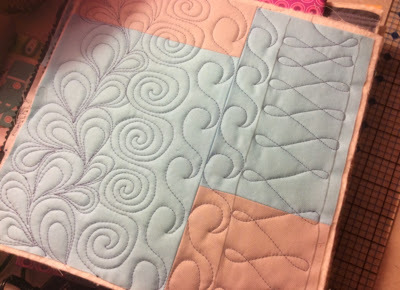 I started with straight lines with the walking foot to echo the seams and will be filling the blocks with a number of different FMQ designs. I have been working on other projects, but my sewing room is such a mess right now, I can't be bothered to try and find them all! I'm guessing organizing the sewing room is going to be a must once New Wave is done and gifted. I also hope to get my act together and start blogging more regularly. December was so busy, both at home and at work, I just didn't have the energy to try and write anything other than shopping lists and meeting minutes! So here's to 2015! Hope it's a good one! Back in June, the President of the Montreal Modern Quilt Guild had the idea that it would be fun to put together a small exhibit of modern quilts in the Montreal area. 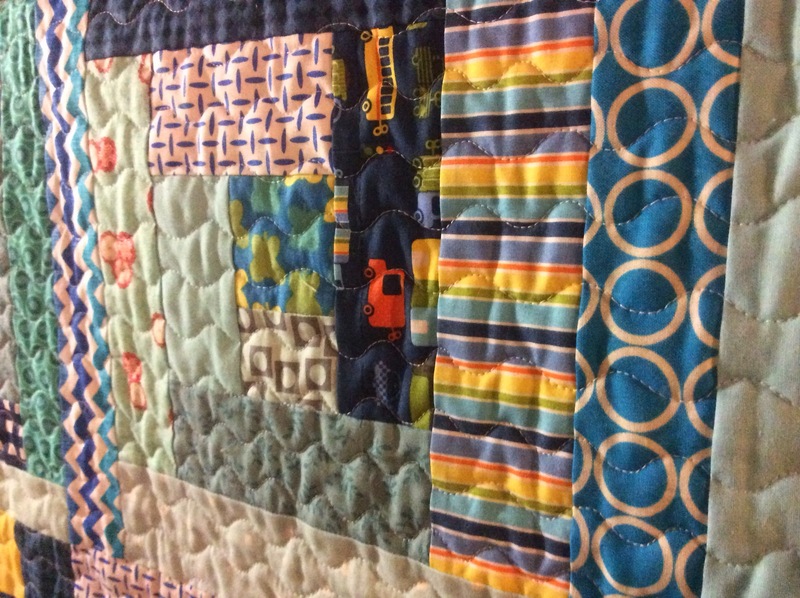 The goal of the exhibit would be to showcase modern quilting, educate the public about modern quilting and maybe even recruit some new members for the Guild. Before we could put on an exhibit though, we needed quilts. So we issued a challenge to the guild members: make a small quilt inspired by one of the design elements of modern quilts. We could choose between improv, negative space, minimalism, asymmetry or alternate grid. 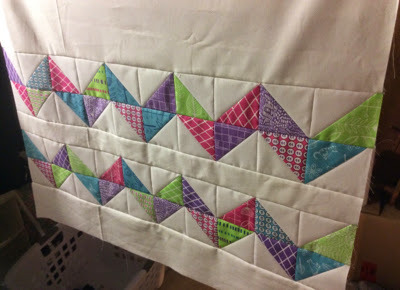 I pinned a number of chevron quilts recently... There's something about those zig zags that I really like. So I pulled a charm pack in nice bright colours and paired them with some Kona Snow to make 4" HSTs. 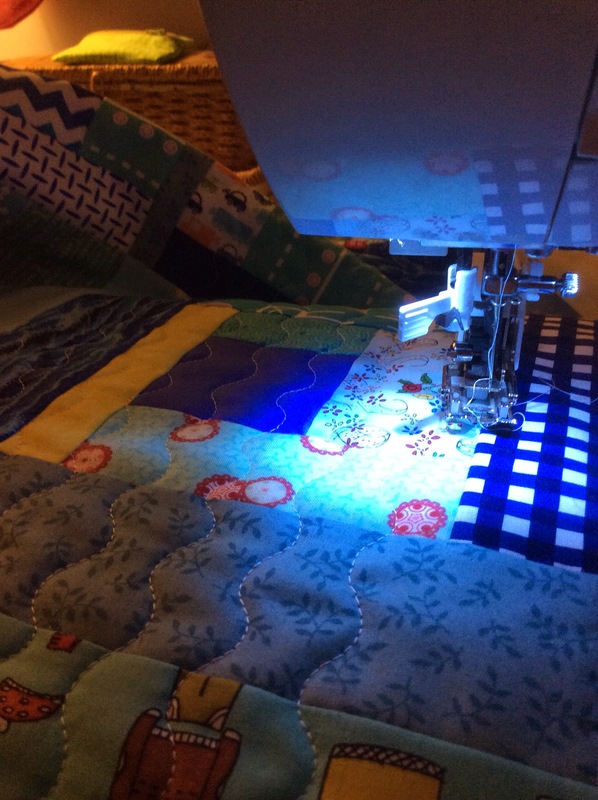 The members of the MMQG will be showing off their quilt tops at the next meeting. I cannot wait to see what everyone else came up with. Now that this quilt top is done, I will be spending most of the coming week working on the two hockey quilts for my nephews. After I finished my mini quilt for the #IGminiswap, I realized that I had stayed away from my sewing for so long over the summer I was now behind on a bunch of things I promised people! So I got started on all of them at the same time! 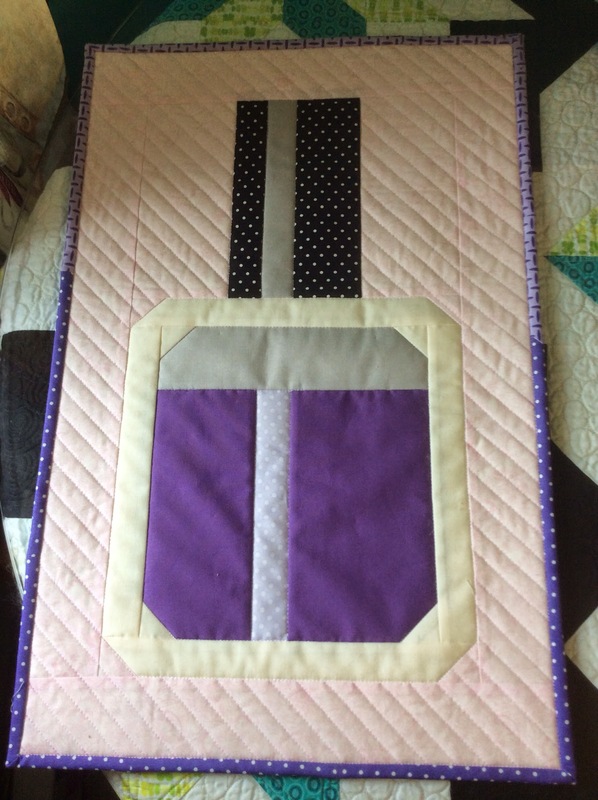 A couple of months ago, my sister-in-law asked me if I could make twin size quilts for my nephews. She was re-decorating their bedroom in a hockey theme as their Christmas present and really wanted matching quilts in the colours of our favourite hockey team. 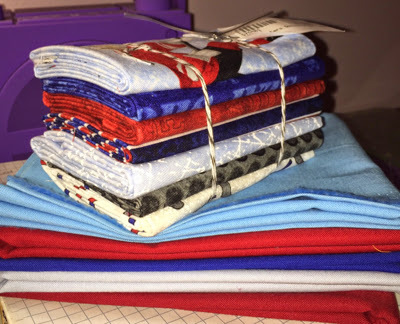 A few weeks later, I got the Sew Sisters newsletter in my inbox and in there was the perfect fat quarter bundle! 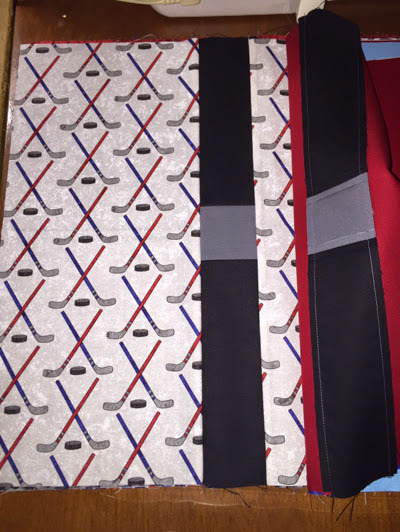 So I ordered 2 plus some Kona solids in red and blue. As soon as the fabric arrived, I started cutting and sewing. Before long I had all the blocks for the first quilt sewn. I hope to have the top finished by the end of the weekend. 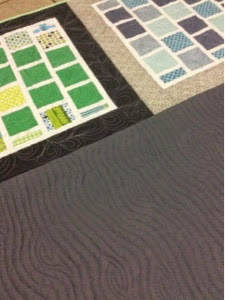 I'll then show it to my sister-in-law and get her stamp of approval before cutting the fabric for the second quilt. 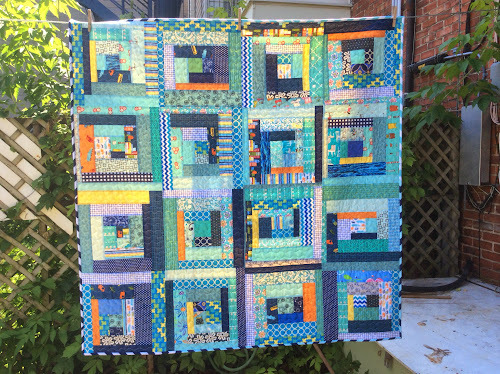 My sweetie loves my quilts and he's asked me to make a quilt for every bed in the new island house he built over the summer. 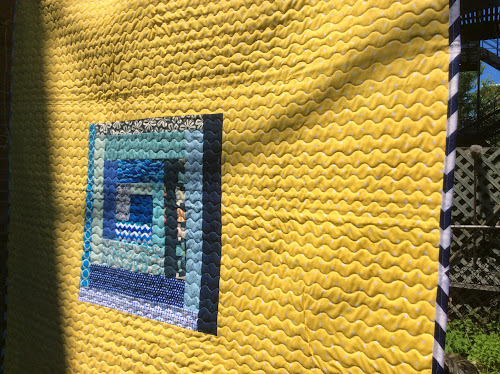 Before I make those quilts though, he asked me to make curtains for all the windows. Plain old curtains won't do though... He requested patchwork curtains! I started looking through my books to find some fun patterns and settled on this one for the first sets of curtains. This is from a Camille Roskelley book. I won't make 92" panels so I modified the pattern somewhat to make it much smaller. I'm using the Birch Farm collection by Joel Dewberry for these along with some fat quarters from my stash. I only cut fabric for 1 panel so far and couldn't help piecing one block, just to see if I would like the look. 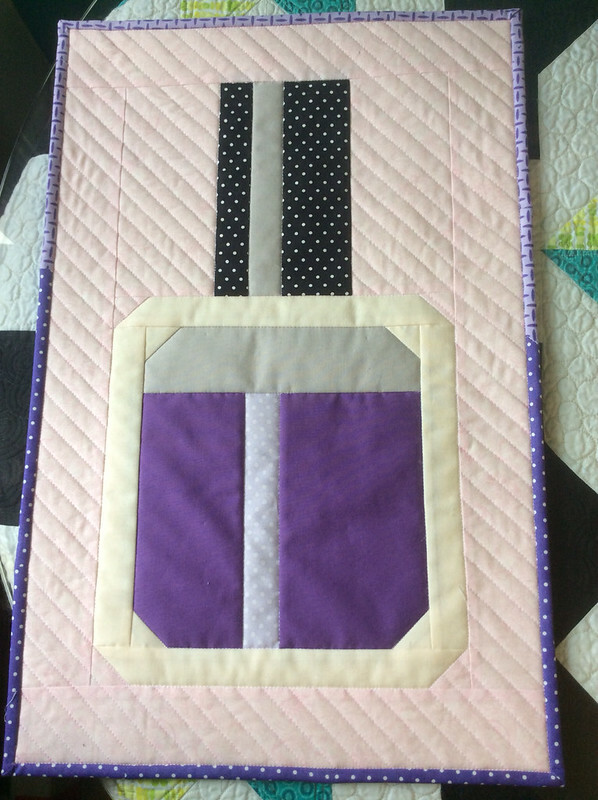 This one isn't really one of my WIPs, but so many of you asked about her progress, I thought I should add my daughter's quilt to my list. 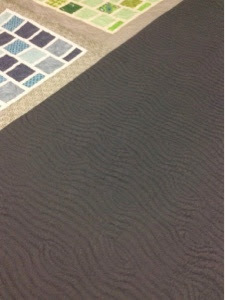 We received many really good suggestions from you in terms of a pattern to go with. 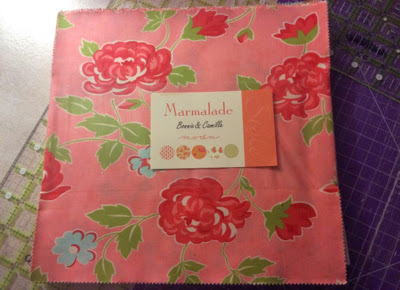 In the end, she settled on a really fun tutorial by Melissa Corry which she found on the Moda Bakeshop. I cannot emphasize enough how perfect this pattern is for my girl. She loves to read! 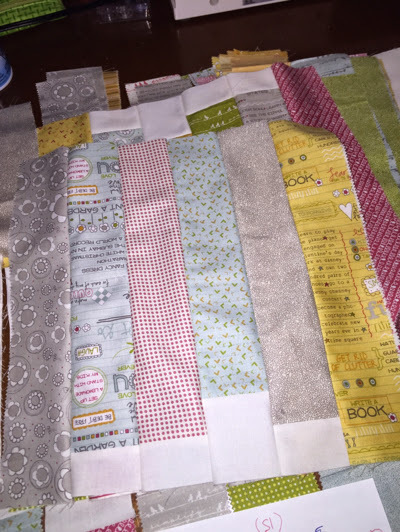 She is using a Noteworthy jelly roll and she's done such a good job so far! I've also got my Supernova quilt top to piece, along with its matching pillow. I want to get started on piecing Scrappy Tiles using that Marmalade layer cake. 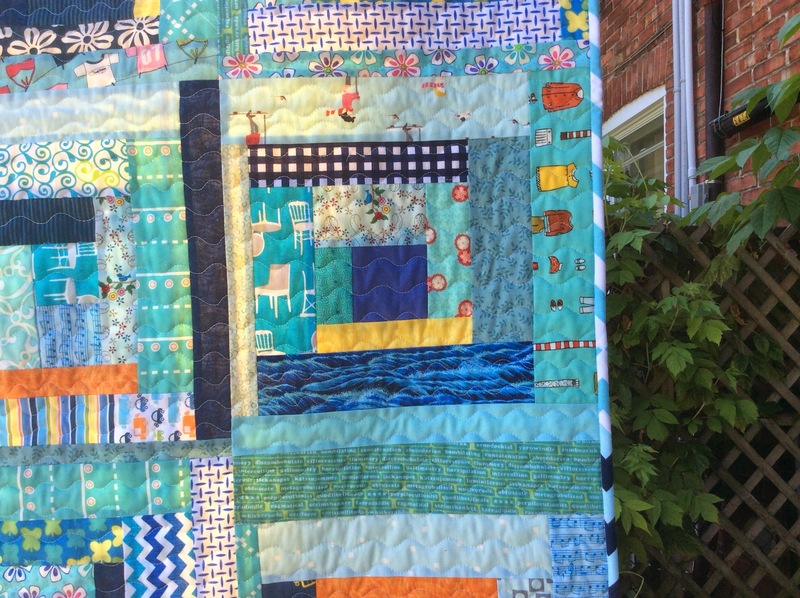 And I have to quilt my New Wave quilt. 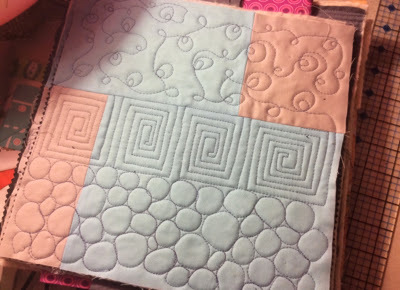 On Saturday, I had the opportunity to attend a free-motion quilting workshop given by MR of Quilt Matters. 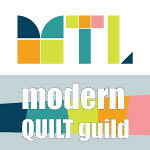 This was a workshop organized by the Montreal Modern Quilt Guild. It was an amazing day! We had 14 members in attendance and according to the feedback I got, everyone was very happy with the event. We learned 9 designs and then MR showed us how we can combine the skills we had practiced to create 3 other designs. Here are pictures of my practice blocks. 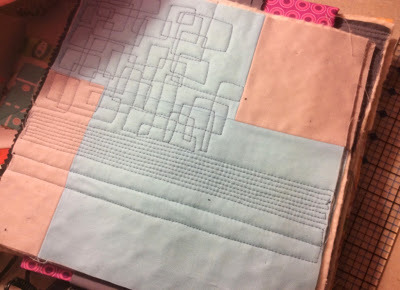 We started with straight lines so matchstick quilting and square stipple. We then moved on to square spirals, double loops and pebbles. And finished with some C shapes (which look like waves), round spirals, paisleys and wishbones. I need to practice some more, but I definitely acquired some new tricks and tips and got to try designs for the first time. I cannot wait to start applying some of these new designs on my quilts. If you have the chance to attend one of MR's workshop, I highly recommend it. She's an amazing teacher. Have you attended a workshop before? Up until then, I had only done Craftsy classes - I have to say that having the teacher in person really added to the experience. I wouldn't hesitate to attend another one. Welcome to TGIFF! I'm so happy to be hosting this week - the added motivation to get this mini finished was awesome. A couple of months ago, on a complete whim, I signed up for the #igminiswap over on Instagram. 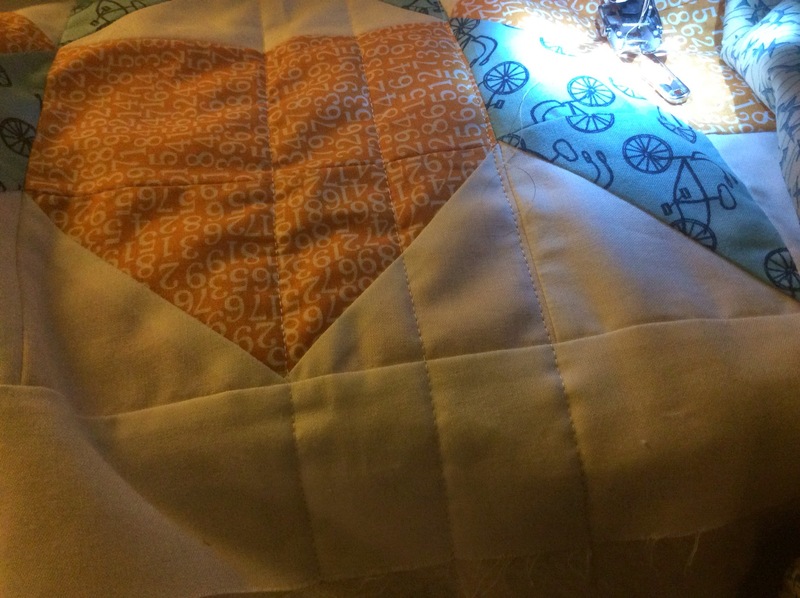 A mini was perfect because it's a relatively small commitment, I knew I could complete it in time and I really love mini quilts. On the down side is the added pressure of making something for a stranger. 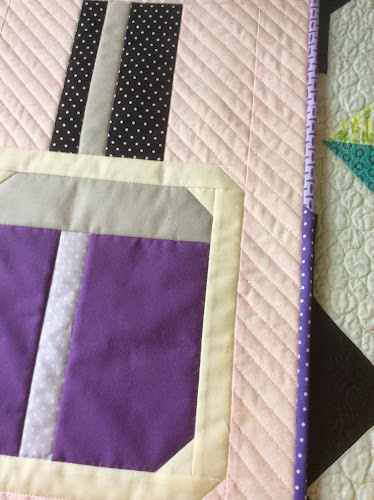 I struggled with finding the right pattern, choosing the right fabric and then deciding how to quilt it. After weeks of indecision, I was browsing through Pinterest pins when I see this one. My partner loves low volume fabric and pops of colours... Perfect match! I used scraps from some of my favourite fabrics for the geese and added more colours in the binding with this fun chevron print. For the quilting, I went with paisleys in the cream background, some straight lines in the darker areas and some simple stitch in the ditch around the geese. I really hope my partner likes it. If you were my partner, would you be happy to receive it? Do you participate in online swaps? Do you also feel extra pressure to make sure everything about your make is absolutely perfect? I'm happy to report that my sewjo is back! 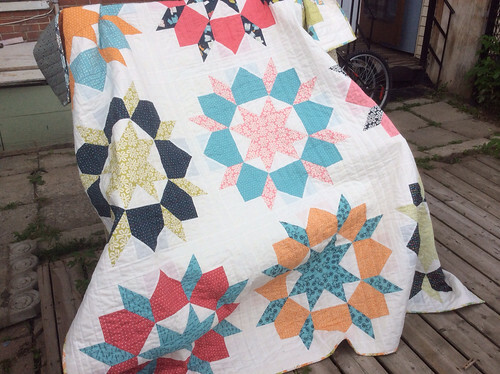 I've been sewing, quilting, planning and I'm even attending a FMQ workshop this weekend with the wonderful M-R Charbonneau of Quilt Matters. I've also been doing a little teaching myself. My daughter is learning how to quilt and started working on her first quilt this week. So what am I working on specifically? First off is a mini for a swap I'm participating in over on Instagram (#igminiswap). 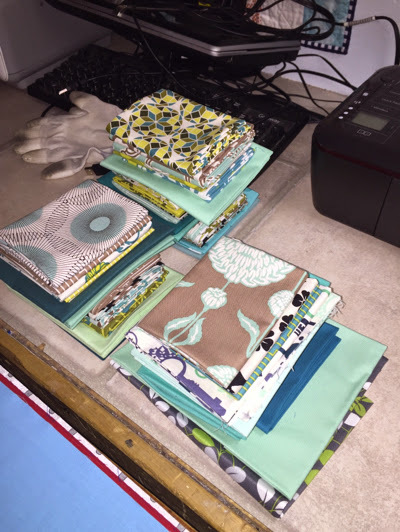 Deciding on a design and then fabrics for my partner was no easy task. I chose a simple pattern with lots of low volume prints and nice pops of colours. Come back later this week for the big reveal! 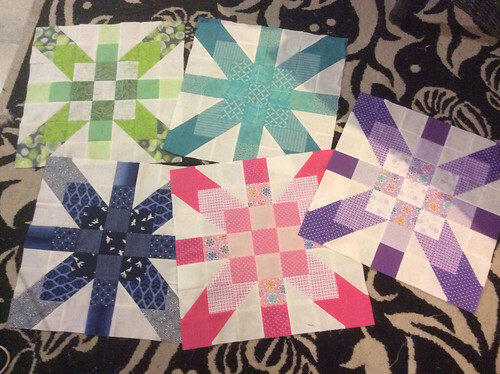 I also sent and then received my last blocks for the SuperNova Friendship Swap. I am literally in love with the blocks my partner Julie and I came up with. How amazing is this quilt going to be?! We each get 10 blocks - 9 for the quilt and an extra for a pillow. I'm so happy to have company in my sewing room! 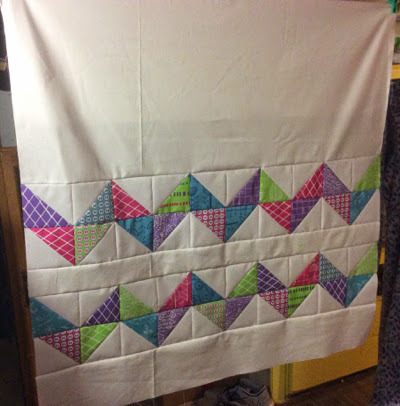 A few weeks ago, my 16 year-old came home from school and announced she wanted to learn how to quilt. 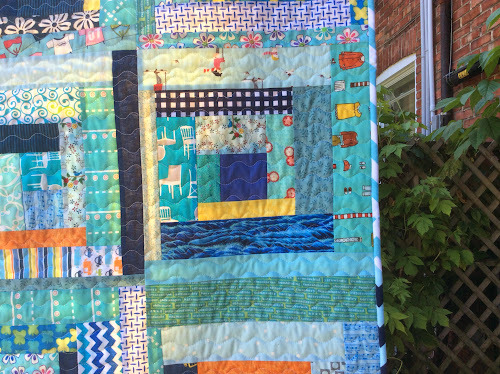 When I asked why the sudden interest in quilting, she said she needed to come up with a big art project for art class. This project would need to be completed by May 2015 and would count toward a huge portion of her mark in that class. I was thrilled that my daughter was so impressed by what I do as a hobby that she would consider doing quilty for art class! 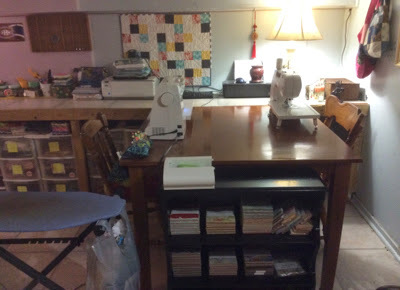 So I drove to the cottage this weekend to pick up my second sewing machine and re-arranged my sewing room so she could have her own little spot. I cannot wait to start our lessons! The next step will be to find a pattern that is easy enough for a beginner, but striking enough to warrant a really good mark. :-) Do you have any suggestions? If you do, please leave a comment. 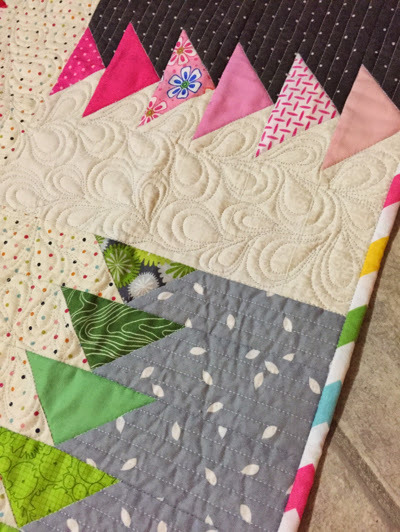 If you have advice on teaching a teenager how to quilt, please leave that too! It feels as though I haven't shared a finish here in ages! September was absolutely crazy for me both at work and at home but last weekend, I managed to put the final stitches in a charity quilt. 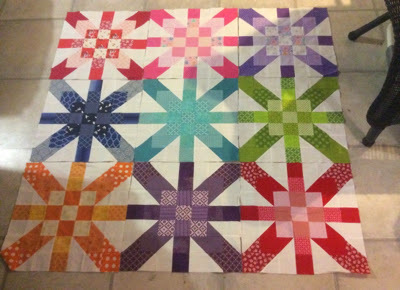 Last Spring, the Montreal Modern Quilt Guild organized a block lottery and participants had to piece a Dancing Queen block (designed by Elizabeth Hartman). Well, instead of using the blocks for herself, the winner of the lottery decided to donate the blocks so we could make charity quilts. I used some Kona cotton in I believe Coal to put a huge border on one side and called it done! I did put more effort with the quilting though. I stitched some wood grain in the grey border. And some big paisleys in the blocks. The size, before washing, is about 50" x 60". 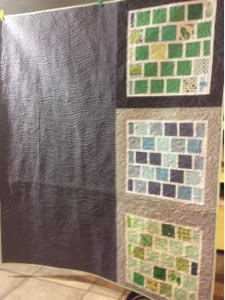 Linking up this finish at Crazy Mom Quilts for Finish It Up Friday. If you follow many blogs, you have probably already read a few of these Around the World Blog Hop posts. I love reading them and learning something about each blogger so when Jamie tagged me, I was more than willing to write my own post. The only thing I've got going at the moment is the Supernova Friendship Swap blocks. Over the last couple of months, sewing has been almost non-existent. Between work, building a new summer house and the nice weather, I just haven't been able to get to my sewing room. I really don't think my work differs from others' work very much. I get so much inspiration from the different blogs I follow, so my work looks a lot like other modern quilters' work. 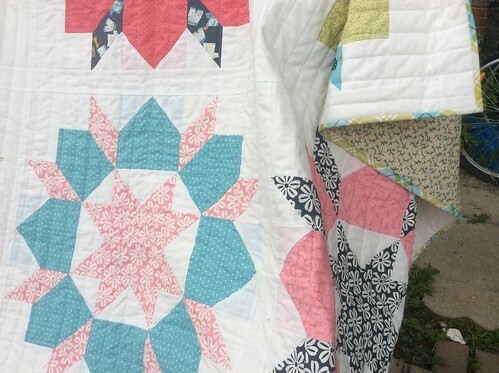 And that's ok. A few months ago, I sort of had an identity crisis because I somehow thought I wasn't a "real" quilter if I didn't create my own designs. 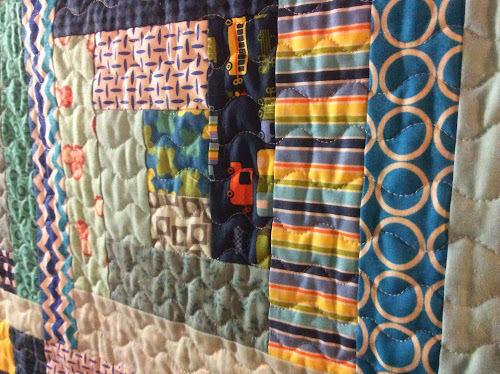 In the end though, I realized that I loved picking fabric, piecing and quilting my quilts. I didn't want to design... I like working with other people's designs. 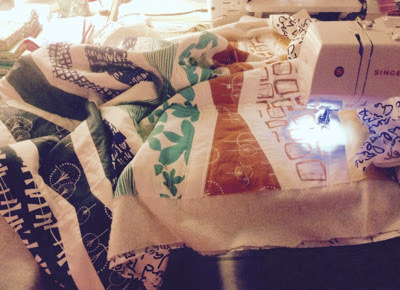 I quilt and blog about quilting because while I'm in my sewing room, I can't think about work! A good sewing session for me is the same as a really good workout or reading a good book. It helps me relax and get away from it all! Now it's my turn to tag someone... And I chose my friend Julie who is my partner in the Supernova Friendship Swap. 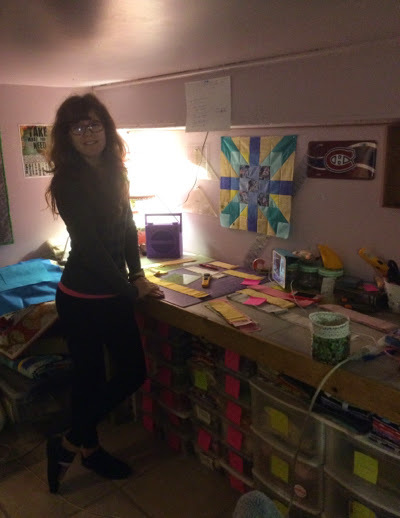 Julie is a super busy mom, but she is also super productive both in the sewing room and with her knitting. And she has the cutest designs in her Etsy shop. 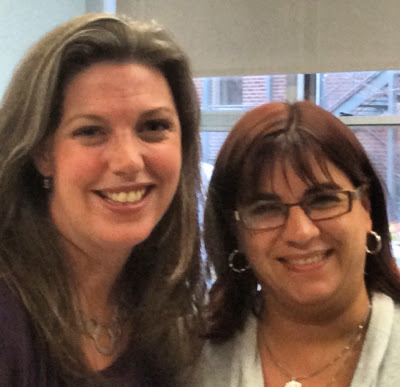 Please visit Julie on her blog and say hello! I pieced the August Supernova Friendship blocks this week and I couldn't be happier with how they turned out! 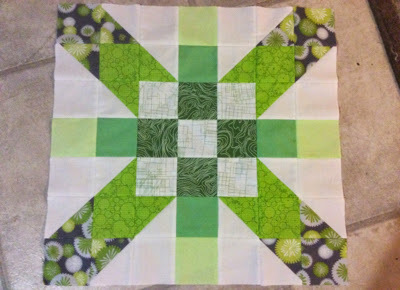 We have now pieced 3 of the 5 blocks and so far, I am loving how they all look together. 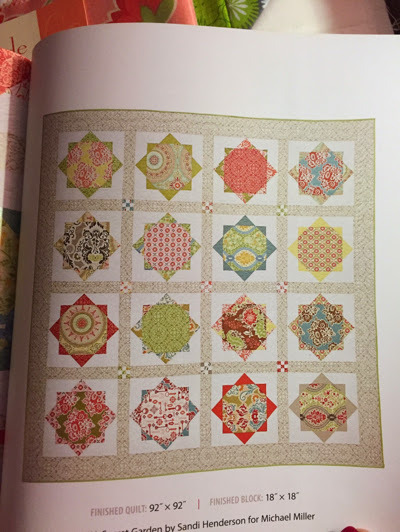 Linking up at Lee's for WIP Wednesday! After I finished my Swoon a couple of weeks ago, I wondered what to work on next. I'm sure I'm not the only one who finds it difficult to start something new after finishing something really big? Anyhow, over the last 2 weeks, I went into my sewing room about a million times and each time, I left without actually doing anything. The weather had something to do with it, but most of all, I think I needed a small break. This week, my Bloglovin and Instagram feeds were filled with Nail Polish bottles... The quilty kind. And all of the sudden, I needed to cut fabric and make a Nail Polish wall hanging! Purple is my favourite colour so of course my nail polish had to be purple. 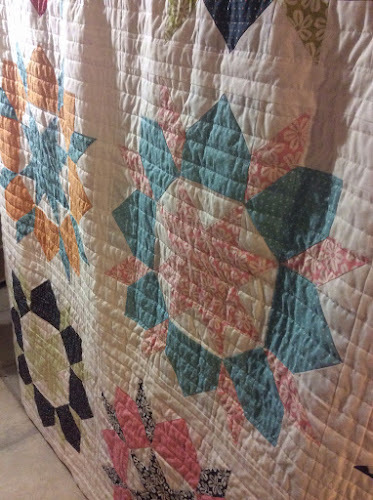 I quilted it in the ditch and then with straight diagonal lines in the background. I'm very pleased with it and it was the perfect thing to get me back in the sewing room again! If you would like to make your own Nail Polish mini quilt, go here. The pattern is incredibly easy and goes together very quickly. I'm not particularly fast and it took me about 3 hours from cutting to binding. 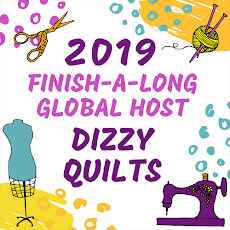 Linking up at Crazy Mom Quilts for Finish It Up Friday and TGIFF hosted by the wonderful M-R of Quilt Matters. TGIFF is here and I think I might Swoon! All right, so I'm not super talented when it comes to original post titles! Unfortunately, the weather wasn't great and I didn't have any quilt holders on hand, but here are a couple of pictures. The designer is obviously the wonderful Camille Roskelley and I used Lucy's Crab Shack to piece the blocks... Kona white as the background... And more Lucy's Crab Shack for the binding. I quilted it with straight lines, about 1 1/4" apart, using painter's tape as my guide. This finish has been in the works for a year people! I still can't believe she is finally done! Have you finished anything recently? Wanna share? Go ahead and link up those wonderful finishes. Be sure to tour the other finishes and spread the comment love far and wide! Please include a link back to TGIFF (button in my sidebar). It's been a while since my last post... I've been really busy quilting my Swoon!! Come back later this week because I've got a couple of exciting things scheduled for Friday - my Swoon reveal AND I'm hosting this week's TGIFF linky! For more info on TGIFF, click the button in my sidebar. 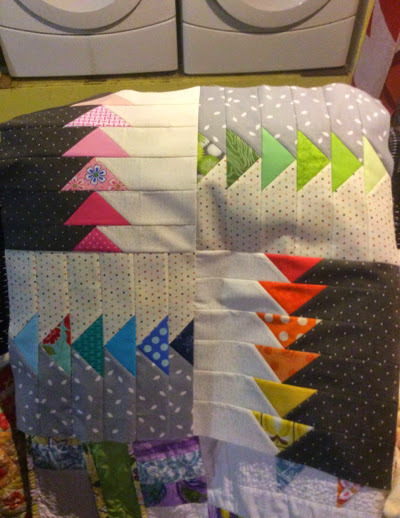 WIP Wednesday: Quilting my Swoon! 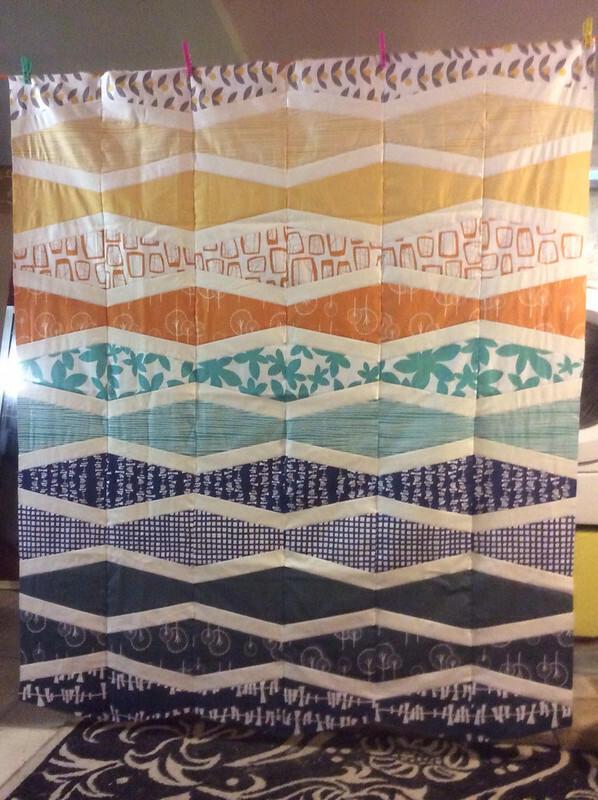 Since I couldn't get started on quilting New Wave, I decided put my Swoon quilt on the sewing machine. 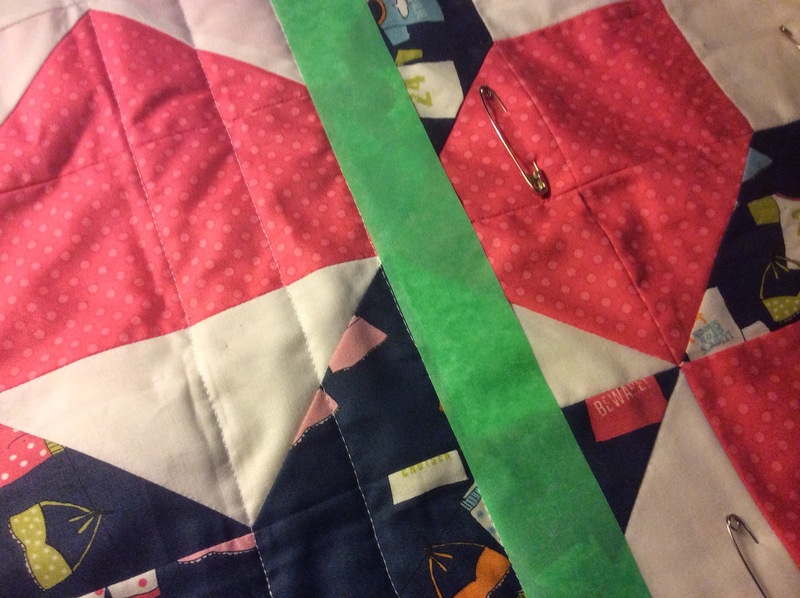 I'm quilting super simple, clean and crisp straight lines. 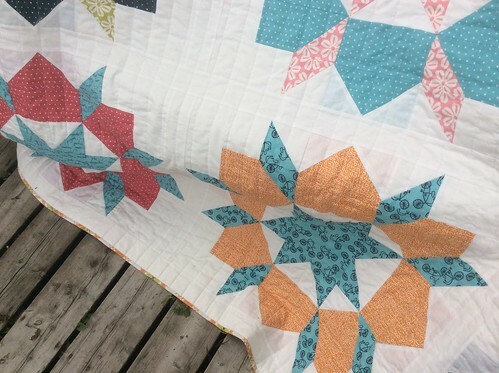 The Montreal Modern Quilt Guild is making quilts for a palliative care centre this year. (Every year, we focus on a different charity.). 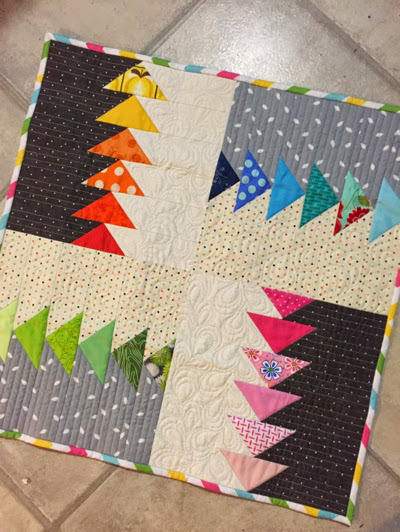 This year, I decided to use up some of my scraps to make my charity quilt and the log cabin block is one of my favourites. I wanted the quilt to be pretty gender neutral so I went with my blue scraps. 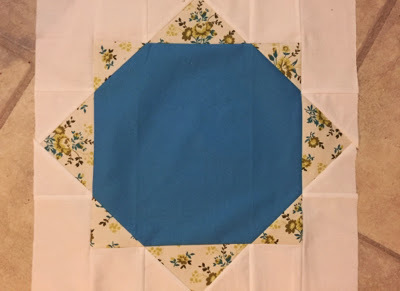 I gave myself these guidelines when selecting scraps: they needed to be blue, except for one log which I wanted yellow or orange. It didn't matter if they were more traditional, or florals, or kids' fabrics, they just needed to be blue. After a couple of days, I had 16 log cabin blocks measuring 12.5" each, so a quilt top of about 48" square.The top sat there for a little while because I wasn't sure how to quilt it. Then a couple of weeks ago, I decided to go with the serpentine stitch on my sewing machine and use my walking foot. The quilting was really fast and easy, but it gives the quilt a wonderful texture. For the binding, I went with a couple of Riley Blake Chevron fat quarters. I love the look of chevrons for bindings. On the back, I made a big log cabin block and surrounded it with the happiest, brightest print I could find in my stash. At first, I wasn't sure about the yellow, but now that it's all done, I love it. Linking up at Crazy Mom Quilts, My Quilt Infatuation and TGIFF.